Washington City Church of the Brethren “laid down” the Brethren Nutrition Program on September 29th, 2017. BNP is no longer in operation. Please find our letter to volunteers and supporters below. We hope to have an archived page up very soon, memorializing our 37 years of service. We ​ ​write ​ ​with ​ ​hope, ​ ​gratitude, ​ ​and ​ ​some ​ ​sadness. ​ After​ ​much ​ ​discernment ​ ​and ​ ​assessment, Washington ​ ​City​ ​Church ​ ​of ​ ​the ​ ​Brethren ​ ​has​ ​decided ​ ​to ​ ​“lay​ ​down”​ ​the ​ ​Brethren ​ ​Nutrition Program. Our​ ​program​ ​was​ ​founded ​ ​in ​ ​1980, ​ ​under​ ​the ​ ​leadership ​ ​of ​ ​Pastor​ ​Duane ​ ​Ramsey​ ​and ​ ​BVSer Richard ​ ​Davis. ​ ​Throughout ​ ​the ​ ​‘80s​ ​and ​ ​‘90s, ​ ​it ​ ​was​ ​frequented ​ ​by​ ​between ​ ​200-300 ​ ​guests​ ​per lunch. ​ ​Over​ ​the ​ ​past ​ ​20 ​ ​years, ​ ​our​ ​program​ ​attendance ​ ​has​ ​steadily​ ​declined. ​ ​While ​ ​we’ve ​ ​gone through ​ ​some ​ ​periods​ ​of ​ ​instability, ​ ​our​ ​program​ ​has​ ​been ​ ​open ​ ​and ​ ​stable ​ ​for​ ​8 ​ ​months​ ​and ​ ​we have ​ ​maintained ​ ​our​ ​current ​ ​average ​ ​of ​ ​22 ​ ​guests​ ​per​ ​lunch ​ ​service. ​ ​Attendance ​ ​is​ ​an ​ ​important factor​ ​in ​ ​measuring ​ ​program​ ​performance. ​ ​Our​ ​program’s​ ​low​ ​attendance ​ ​is​ ​not ​ ​able ​ ​to ​ ​offset our​ ​bare-bones​ ​budget, ​ ​which ​ ​has​ ​resulted ​ ​in ​ ​a ​ ​$12.55 ​ ​cost ​ ​per​ ​meal. ​ ​We ​ ​could ​ ​serve ​ ​five ​ ​times the ​ ​number​ ​of ​ ​people ​ ​we ​ ​do ​ ​with ​ ​the ​ ​money​ ​we ​ ​spend, ​ ​but ​ ​despite ​ ​outreach ​ ​efforts​ ​and consistent ​ ​hours, ​ ​we ​ ​have ​ ​not ​ ​seen ​ ​a ​ ​significant ​ ​increase ​ ​in ​ ​program​ ​attendance. Our​ ​kitchen ​ ​is​ ​in ​ ​desperate ​ ​need ​ ​of ​ ​renovation ​ ​and, ​ ​with ​ ​a ​ ​$50,000 ​ ​project ​ ​just ​ ​tipping ​ ​off ​ ​the renovation ​ ​process, ​ ​it ​ ​made ​ ​us​ ​question ​ ​how​ ​much ​ ​longer​ ​the ​ ​program​ ​would ​ ​be ​ ​around. ​ ​DC has​ ​changed ​ ​in ​ ​the ​ ​nearly​ ​40 ​ ​years​ ​since ​ ​we ​ ​opened. ​ ​Poverty, ​ ​hunger, ​ ​and ​ ​homelessness​ ​on Capitol ​ ​Hill ​ ​look​ ​very​ ​different ​ ​than ​ ​when ​ ​our​ ​program​ ​was​ ​founded. ​ ​At ​ ​a ​ ​recent ​ ​DC​ ​Food ​ ​Policy Council ​ ​meeting, ​ ​we ​ ​learned ​ ​that ​ ​Ward ​ ​6 ​ ​(where ​ ​our​ ​program​ ​is​ ​located)​ ​is​ ​home ​ ​to ​ ​10 ​ ​grocery stores​ ​for​ ​about ​ ​75,000 ​ ​residents, ​ ​while ​ ​Wards​ ​7 ​ ​& ​ ​8 ​ ​have ​ ​three ​ ​grocery​ ​stores​ ​between ​ ​the ​ ​two of ​ ​them​ ​for​ ​a ​ ​total ​ ​of ​ ​nearly​ ​140,000 ​ ​residents. ​ ​It ​ ​is​ ​unlikely​ ​that ​ ​Capitol ​ ​Hill ​ ​will ​ ​ever​ ​have ​ ​the same ​ ​volume ​ ​of ​ ​people ​ ​experiencing ​ ​homelessness​ ​and ​ ​food ​ ​scarcity​ ​as​ ​it ​ ​did ​ ​when ​ ​our program​ ​began. ​ ​Additionally, ​ ​service ​ ​providers​ ​like ​ ​Capitol ​ ​Hill ​ ​Group ​ ​Ministry​ ​have ​ ​made ​ ​great strides​ ​in ​ ​addressing ​ ​chronic​ ​homelessness​ ​in ​ ​DC. ​ ​These ​ ​facts​ ​have ​ ​led ​ ​our​ ​church ​ ​community to ​ ​decide ​ ​to ​ ​“lay​ ​down”​ ​the ​ ​ministry, ​ ​giving ​ ​thanks​ ​for​ ​what ​ ​has​ ​been ​ ​done. ​ ​Many​ ​meals​ ​have been ​ ​served, ​ ​kind ​ ​words​ ​shared, ​ ​and ​ ​relationships​ ​built. While ​ ​there ​ ​are ​ ​reduced ​ ​needs, ​ ​we ​ ​do ​ ​still ​ ​serve ​ ​lunch ​ ​and ​ ​mail ​ ​to ​ ​some​ ​people. ​ ​Thankfully, there ​ ​are ​ ​other​ ​organizations​ ​in ​ ​Capitol ​ ​Hill ​ ​that ​ ​provide ​ ​a ​ ​variety​ ​of ​ ​services​ ​who ​ ​will ​ ​be ​ ​able ​ ​to fill ​ ​any​ ​gaps​ ​caused ​ ​by​ ​our​ ​closing. ​ ​​Shirley’s​ ​Place​, ​ ​a ​ ​day​ ​center​ ​run ​ ​by​ ​Capitol ​ ​Hill ​ ​Group Ministry, ​ ​provides​ ​snacks, ​ ​showers, ​ ​computer​ ​access, ​ ​and ​ ​more, ​ ​to ​ ​people ​ ​in ​ ​need. ​ ​It ​ ​is​ ​about ​ ​a 15 ​ ​minute ​ ​walk​ ​from​ ​our​ ​church. ​ ​Across​ ​the ​ ​street, ​ ​there ​ ​is​ ​​Our​ ​Daily​ ​Bread ​ ​at ​ ​the ​ ​Capitol ​ ​Hill United ​ ​Methodist ​ ​Church, ​ ​who ​ ​serve ​ ​breakfast ​ ​five ​ ​days​ ​a ​ ​week​ ​and ​ ​a ​ ​meal ​ ​after​ ​church ​ ​on Sundays. ​ ​Further​ ​out, ​ ​SOME ​ ​serves​ ​breakfast ​ ​and ​ ​lunch ​ ​in ​ ​addition ​ ​to ​ ​providing ​ ​clothing, showers, ​ ​medical ​ ​care, ​ ​and ​ ​case ​ ​management ​ ​to ​ ​people ​ ​experiencing ​ ​homelessness. We ​ ​are ​ ​so ​ ​grateful ​ ​for​ ​the ​ ​decades-long ​ ​support ​ ​from​ ​local volunteers, spring break groups, and from churches and individuals across​ ​our​ Church of the Brethren ​denomination. ​ ​Congregations, workcamps, ​ ​BVSers, ​ ​individual ​ ​volunteers, ​ ​and ​ ​more: ​ ​the ​ ​ministry​ ​of ​ ​Brethren ​ ​Nutrition ​ ​Program has​ ​certainly​ ​been ​ ​enriched, ​ ​sustained, ​ ​and ​ ​encouraged ​ ​by​ ​sisters​ ​and ​ ​brothers​ ​across​ ​the ​ ​US. We ​ ​recognize ​ ​that ​ ​this​ ​decision ​ ​may​ ​bring ​ ​many​ ​emotions. ​ ​We ​ ​have ​ ​volunteers​ ​and ​ ​supporters who ​ ​have ​ ​given ​ ​so ​ ​much ​ ​love, ​ ​effort, ​ ​time, ​ ​commitment, ​ ​and ​ ​funds​ ​to ​ ​the ​ ​Brethren​ ​Nutrition Program. ​ ​Please ​ ​know​ ​that ​ ​we ​ ​did ​ ​not ​ ​enter​ ​into ​ ​this​ ​conversation ​ ​or​ ​this​ ​decision ​ ​lightly. ​ ​Thank you ​ ​for​ ​what ​ ​you ​ ​have ​ ​done ​ ​and ​ ​how​ ​you ​ ​have ​ ​supported ​ ​the ​ ​cause ​ ​of ​ ​serving ​ ​hungry neighbors​ ​on ​ ​Capitol ​ ​Hill. ​ ​If ​ ​you ​ ​are ​ ​interested ​ ​in ​ ​volunteering ​ ​before ​ ​the ​ ​program​ ​comes​ ​to ​ ​a close, ​ ​you ​ ​can ​ ​sign ​ ​up ​ ​​here ​. ​ ​We ​ ​are ​ ​in ​ ​particular​ ​need ​ ​of ​ ​volunteers​ ​for​ ​this​ ​coming ​ ​Monday, August ​ ​21st, ​ ​and ​ ​throughout ​ ​the ​ ​month ​ ​of ​ ​September. Again, ​ ​we ​ ​are ​ ​tremendously​ ​grateful ​ ​for​ ​your​ ​continued ​ ​and ​ ​dedicated ​ ​support. The Brethren Nutrition Program existed for 37 years, to serve hungry neighbors on Capitol Hill, providing healthy and wholesome lunches to those in need. 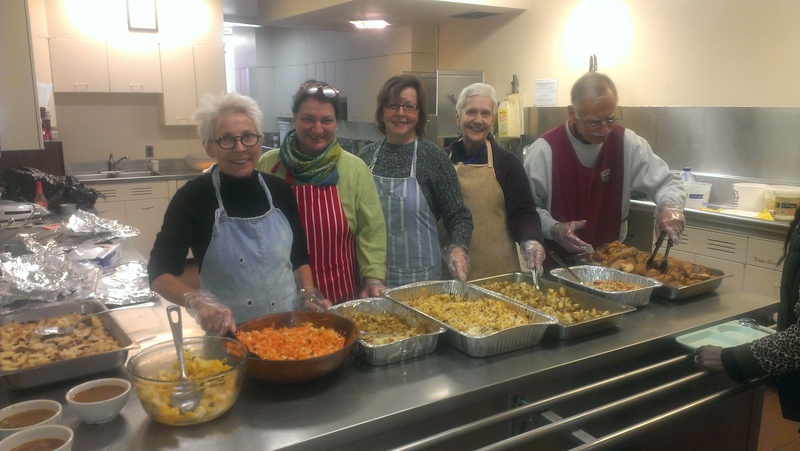 With its open door policy, the Soup Kitchen welcomed everyone to join in the meals – there were no eligibility requirements. Many of the guests were unemployed and homeless; others were employed, but resided in shelters while they searched for permanent, affordable housing. A meal at the Soup Kitchen also became one way that a number of guests were able to stretch severely limited incomes.